The weather today was gorgeous. Perfect for spending time outside... which I did, for about twenty minutes in the park today, tagging along with people looking for good trees for slacklining, wishing I had a camera with me. But I didn't, and when I looked at my watch, realized I was running late for an appointment. It's amazing how warm 65 degrees and breezy can feel when you're rushing up a slight incline. However, the weather is not at all related to pumpkin pie. 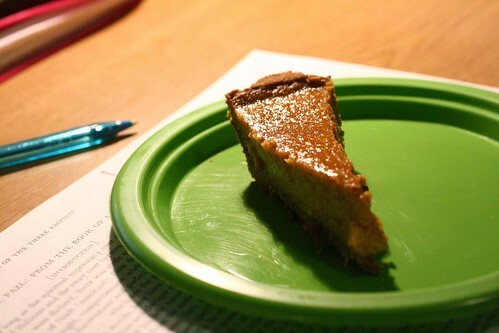 I just felt like making a pumpkin pie, and that's exactly what I did. While it may not feel quite crisp enough yet to be December, I'll take this over last week's rain that made me consider building an ark. Pumpkin pie might just be the easiest thing I've baked since I got here. The only thing I've made that's been easier is probably super simple fudge with peanut butter on top. And technically, my roommate made it. So enjoy fall and be all seasonal. Bake a pumpkin pie! Oh, and did you know that there's a pumpkin shortage? Note: Since starting college, I've come to like making things that are easy, simple, and require few dishes. Had I been ambitious, and had more pans, I probably would have made the dough from tassies and made miniature pumpkin pies. Much easier to share, but instead, this will have to do. Also, I had some leftover filling. 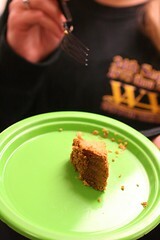 Either follow the original recipe, use a larger graham cracker crust, or just bake off the extra in a mini-muffin pan. Preheat oven to 350ºF. Whisk the eggs. Whisk in sugar, pumpkin pie spice, and salt. Stir in pure pumpkin. Gradually stir in evaporated milk. Pour into prepared crust. Hide from hungry eyes and noses for an hour to cool, and then cut and serve. Look. Pretty Leaves. And Cake!